"It's Truly, Truly OutrageousTruly, truly, truly Outrageous"It's time for you to transform into your favorite cartoon singer from the '80s, JEM! This wonderfully retro costume will have you looking just like the classic character you watched sing her heart out every Saturday morning. Now you can belt out your favorite songs from that decade when you wear this adorably fun costume. One fabulous way to celebrate the 80s would be to become Jem's arch rival from the Misfits Pizzazz! You'll have that total 'rich girl who gets everything she wants' look when you wear this costume. 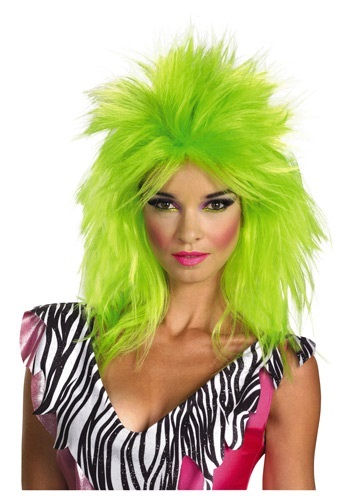 And be sure to pick up our great bright green Pizzazz wig so you'll be ready to take the stage and make Jem and Holograms jealous. How do you beat Gem and the Holograms in the music business? You'll need to assemble a couple of your friends together to form a band, you'll need a cool name for the band, like the Misfits and of course, you're going to need some teased green hair. This wig takes care of that last part easily, so you just have to worry about the other two.